So here it is, our fourth (FOURTH!) cocktail calendar for the holiday season. Who knew so many cocktails could be made? Who knew so many drinks could be tested? Who knew so much booze could be hounded??? As mentioned in the intro post, this year's theme focuses on traditions around the holiday season. First up, traditions/celebrations focused around the Winter Solstice. While many cultures have a specific mid-winter celebration, some often focus on the general idea of Light defeating Darkness. One such celebration is the holiday of Diwali or Deepavali. The name Deepavali stems from the rows (avali) of clay lanterns (deepa) that are traditionally used to decorate homes during the festival. While officially a holiday in countries throughout Asia, Africa and South America, Diwali is celebrated the world over by Hindus, Jains, Sikhs and Buddhists. And even though there is regional variation over the interpretation Diwali, the central tenet remains the same: the triumph of light over dark, knowledge over ignorance, good over evil and hope over despair [Amen! -Kate]. We recognize that most who celebrate Diwali do not drink alcohol, but we felt that it was an important Light festival to mark in our calendar. Our cocktail includes the flavours traditionally found in the treats consumed around Diwali such as apricot, sesame and rosewater. Combine ingredients in a shaker. Dry shake til combined. Add ice. Shake some more. Strain to get any remaining tahini solids out. Pour into coupe glass. Garnish with sesame square or light sprinkling of sesame seeds. We originally tried this with 1/2 Hendrick's and 1/2 Beefeater. But the Beefeater was too clean - needed some other botanicals in the gin to appear. So we switched to Bombay East. The lemongrass is really picked up. Rosewater is mighty - only a couple of dashes will do. Tried a 1/2 bar spoon of Cointreau, but made it a little heavy. Before we tried the tahini, we put in a few salt flakes. That got us onto the right path with the tahini. For today's cocktail, we knew we wanted to make something creamy but not necessarily use milk or ice cream. 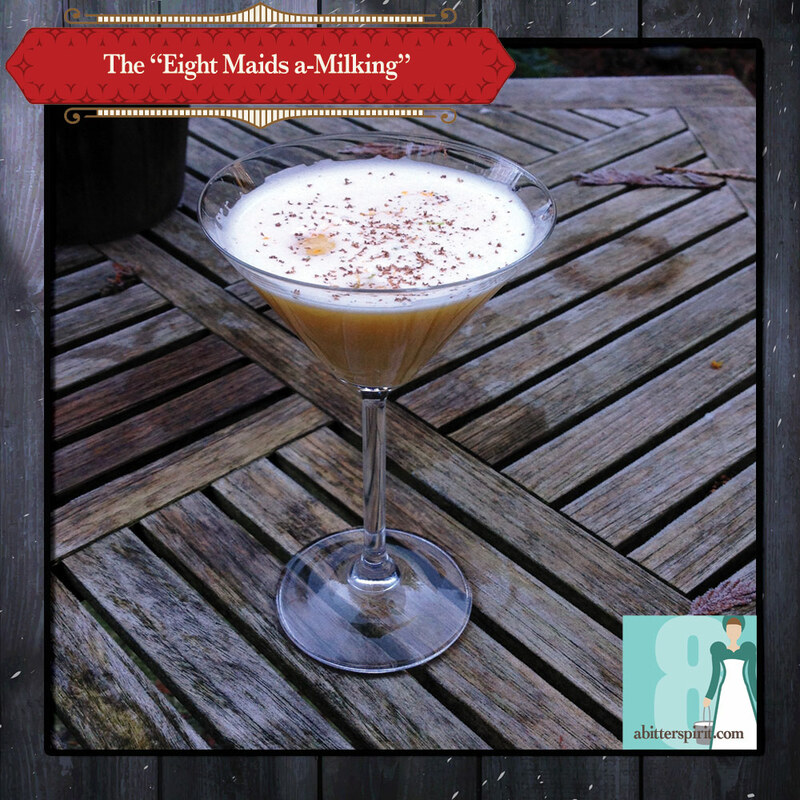 Kate had recently seen this recipe from Lauren Mote for a "Chartreuse Milkshake" that she thought was nifty. We modded it into a flip; using the full egg in the cocktail makes it extra rich and velvety. Combine all the ingredients into a cocktail shaker and dry shake it for at least 20 seconds. Add ice and shake until cold. Double strain into a martini glass and top with grated zest and chocolate shavings. 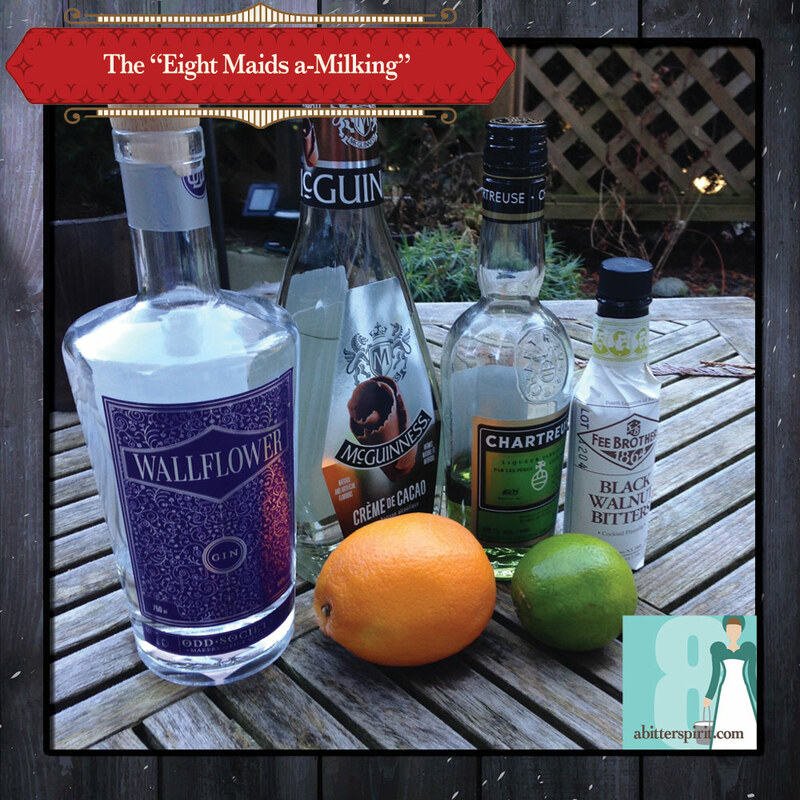 As mentioned above, this drink is a slight riff on a drink by Vancouver bartender and bitter maker, Lauren Mote. We put in a full egg to up the richness and creaminess and added the black walnut bitters to enhance the chartreuse notes. 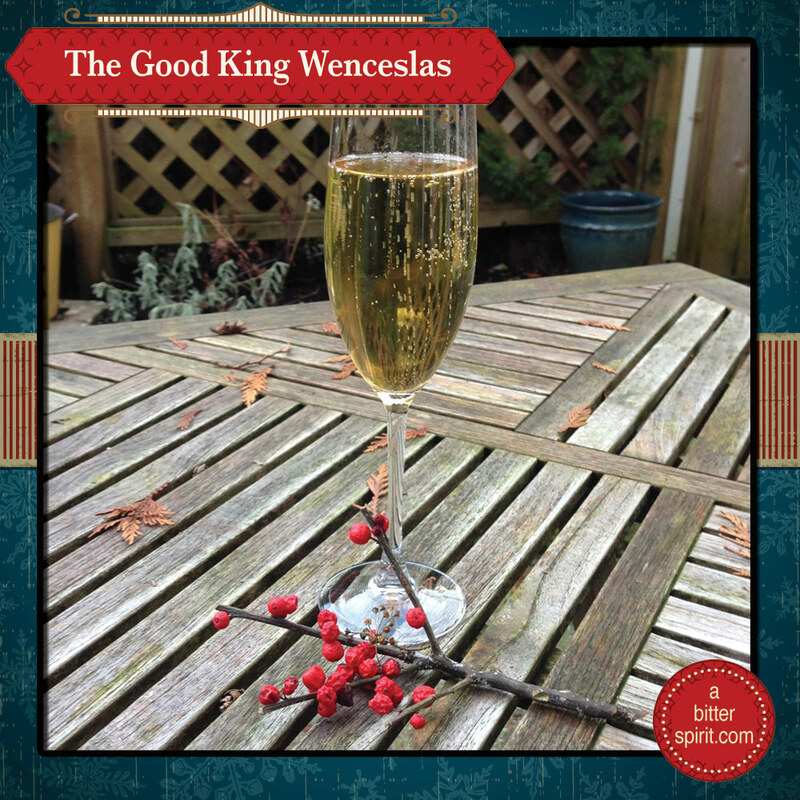 The carol for today's cocktail is Good King Wenceslas. The lyrics tell the story of the 10th century Duke of Bohemia, Saint Wenceslas I. Legend has it that he rose at night from his bed to bestow alms on widows, orphans, prisoners and others afflicted with various difficulties. While the lyrics were written by an Englishman (John Mason Neale), the tune is based on an old Finnish spring carol, Tempus adest floridum ("The time is near for flowering"). Consequently, we wanted the cocktail to reflect Finnish culture in some way. There is a traditional liqueur made in Finland using cloudberries (called bakeapple or knotberry in other countries) so we decided to use that as the cornerstone of the cocktail. Unfortunately, the Finnish liqueur is nearly impossible to get in North America. Luckily for us, a Quebec company makes its own version of a cloudberry liqueur using cloudberries (there called bakeapple) from Newfoundland. Even more lucky for us, Kate has a contact in Quebec who generously shipped a bottle to us (because BC Liquor stores don't stock it - what up with that, BC Liquor?!). So thank you very much, Michelle Sullivan! We couldn't have done this without you. We want to keep as much of the cloudberry flavour in the drink as possible, so we riffed on a French 75. Place the gin, cloudberry liqueur, simple syrup and bitters into a cocktail shaker with ice. Shake until chilled. Fill the flute half way with champagne. Strain the contents of the shaker into the flute. 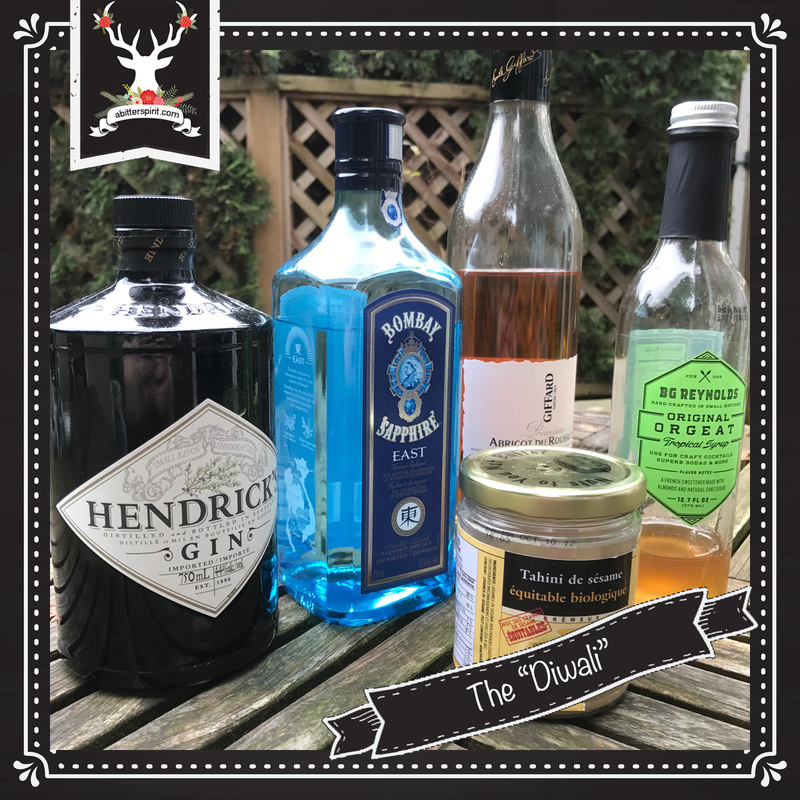 We used Hendricks gin because we thought the floral nature of the gin would pair well with the cloudberry. The peppercorn syrup (mostly pink with some black thrown in) added a nice spiciness. 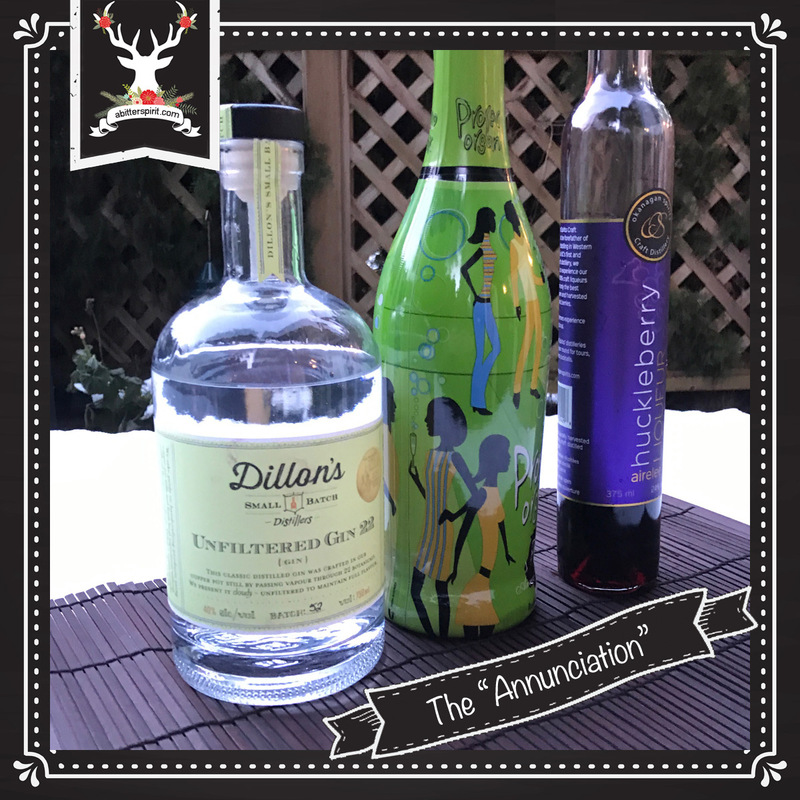 We tried two different bitters in this cocktail, Dillion's DSB & Bittered Sling Denman. Both worked well but the Denman enhanced the cloudberry the best. 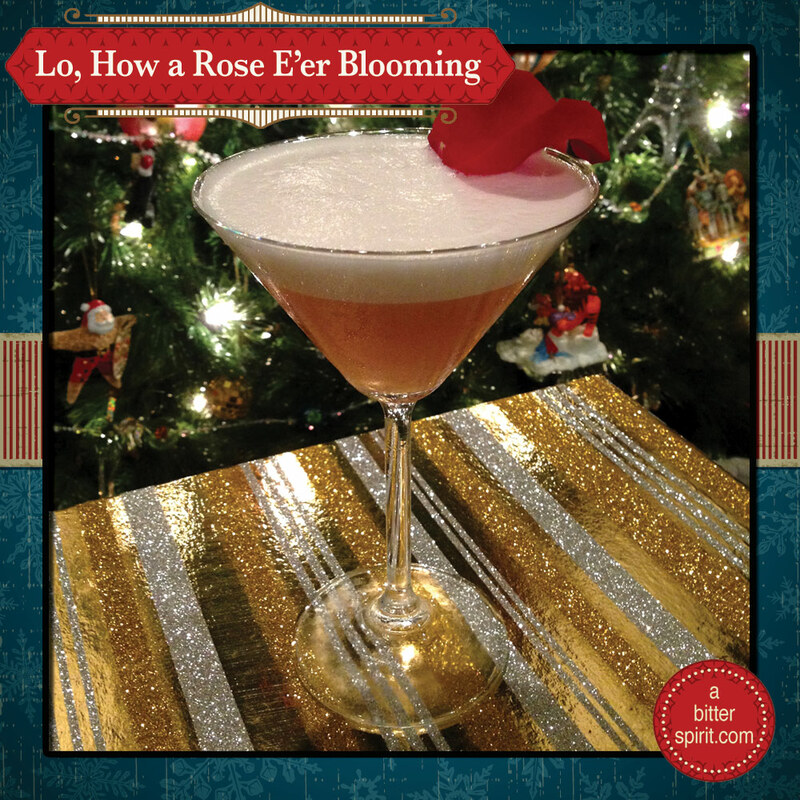 The song inspiration for today's cocktail is the German carol, Lo, How a Rose E'er Blooming. The text dates from around the late 16th century and was originally a carol about Mary, comparing her to the mystical rose of Sharon. There is also a source that states the true origin of the hymn is an apocryphal story of a monk in Trier, Germany who found a rose blooming on Christmas eve. He picked it and placed it before a statue of the Virgin Mary - which also explains the Christmas connection. But then the Protestants got ahold of the carol and made it all about Jesus. 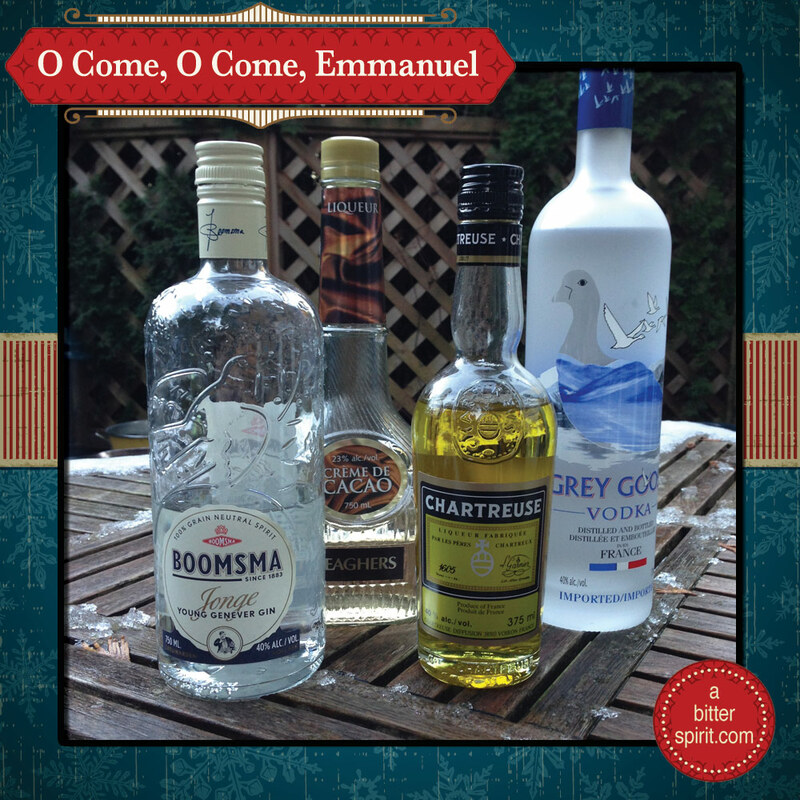 We're taking back the original meaning and inspiration in our boozy celebration of Mary! Given the title of the song, we wanted rose to be one of the dominant flavours in the cocktail but also didn't want it to taste like grandmother's Avon order (are we dating ourselves?). To avoid a perfumey pitfall, we created a very straight-forward gin sour that uses oleo saccharum, a popular ingredient in 19th century cocktails. Oleo saccharum (or "sugar oil") is a mixture of sugar and essential oils; the most common version is derived from lemon rind, but can be created from other ingredients. For this drink, we extracted the essence from the rose petals to create a rose oleo saccharum. Pour all of the ingredients into a cocktail shaker and dry shake for approximately 30 seconds. Then add ice to the shaker and shake until cocktail is chilled. Double stain into a cocktail glass. 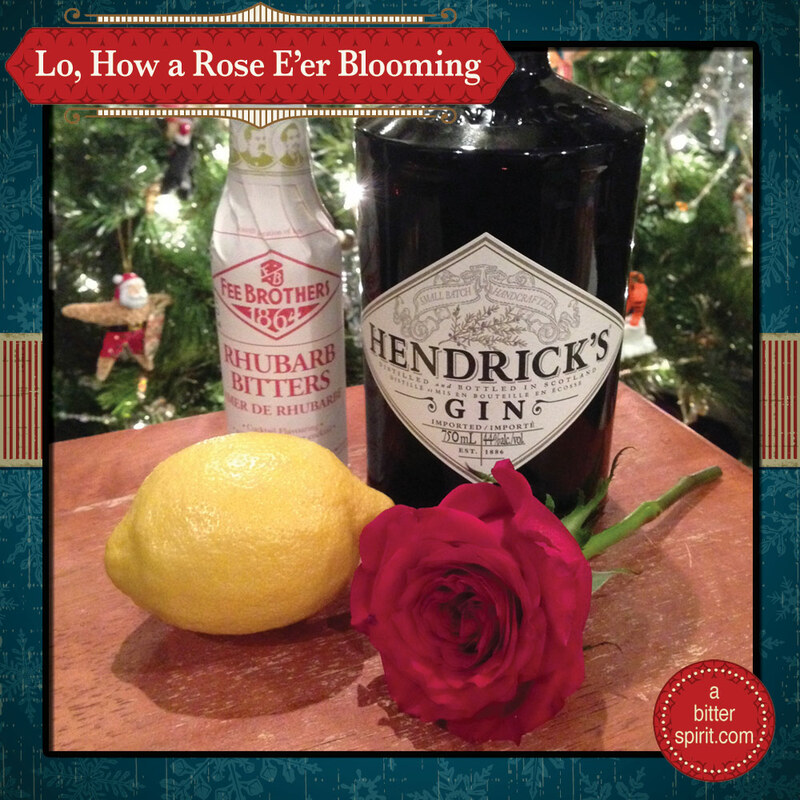 Garnish with a rose petal. The cocktail is a straightforward gin sour. 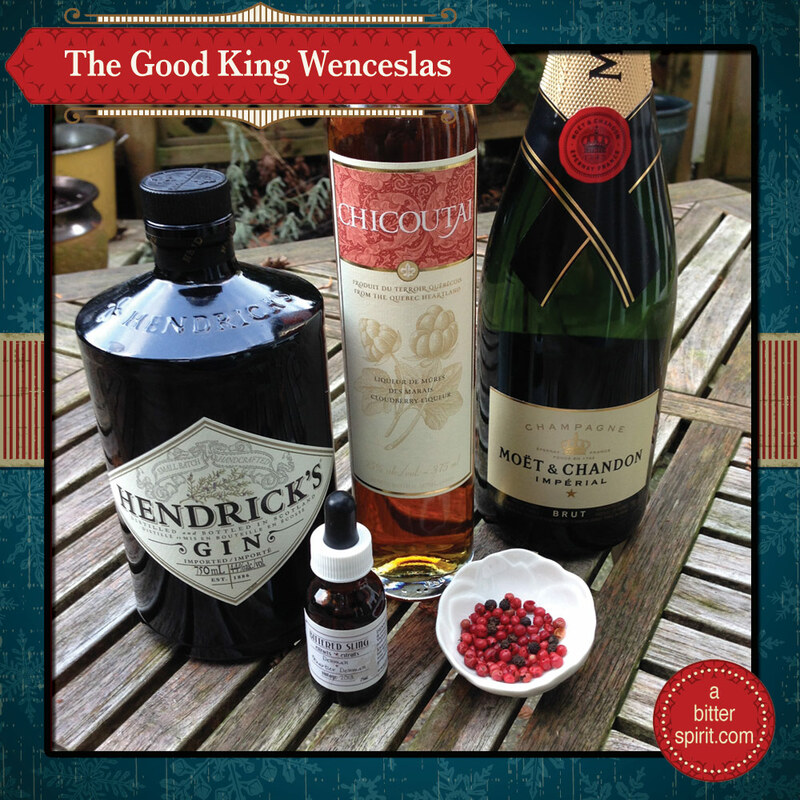 We used Hendicks gin because it is infused with Bulgarian Rosa Damascena. Originally, we intended this cocktail to be a variation on a Ramos Fizz with rose and pink peppercorn syrup. But the flavours weren't jiving well, so we pulled back and went with something fairly simple to highlight the rose. We added the rhubarb bitters to help enhance the citrus and berry notes of the rose oleo saccharum. Pull the petals off of the roses and wash them, removing any that are damaged. Lightly dry. Divide the petals and sugar between two resealable plastic bags. Seal the bags, squeezing as much of the air out of the bag as possible. Gently massage the sugar into the petals. Leave petals in the bags for approximately 36 hours, massaging them into the sugar to facillitate their wilting and breaking down. After about 18 hours if no liquid has begun to form, add about a tablespoon of water to each bag and massage the petals more frequently. After 36 hours, there should be a thick red liquid forming in the bottom of the bag. Cut a corner off the bottom of bag and strain the liquid through a fine sieve or cheesecloth. Squeeze the petals to extract the remaining syrup. If the syrup looks cloudy, add a couple of drops of lemon juice. The syrup should be very sweet and have a complex flavour of roses. It will also be quite vegetal on the nose. This sorts itself out once the syrup is used in a cocktail. This guy playing Lo, How a Rose E'er Blooming on harmonica rocks our world! 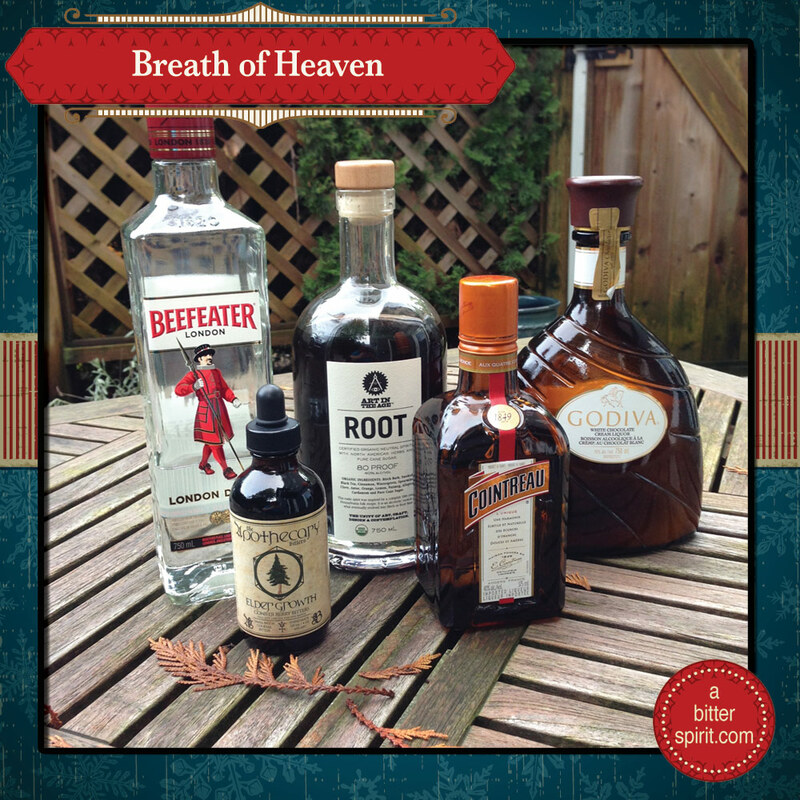 Today's cocktail inspiration comes from the contemporary song, Breath of Heaven (Mary's Song). Christian country singer Amy Grant first heard a version of the song when the composer, Chris Eaton, was a member of her touring band. Pregnant at the time, Grant thought the music and the chorus fit perfectly with the idea of a frightened young girl who was told she was going to bear the Messiah. She reworked the verses and turned the song into one with a Christmas message. 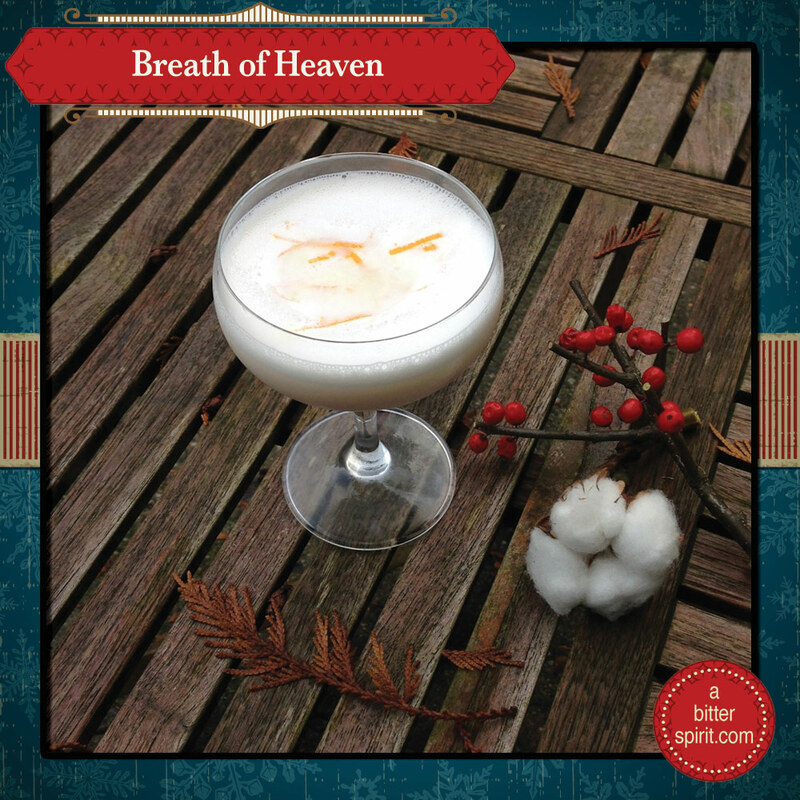 Breath of Heaven brought to mind something light and airy with a bright flavour. We started with a riff on the Twentieth Century cocktail which is a combination of gin, lemon and touch of chocolate; we used Godiva White Chocolate and added egg white to create a lighter texture. As noted below, we eventually changed out the lemon for orange and added a bit of sasparallia flavour to create a unique and fresh-tasting drink. Pour all ingredients into a shaker. Dry shake for approximately 30 seconds. Add ice and shake until chilled. Double strain into a coupe glass. This cocktail underwent several trials (and some tribulations .. like Mary). We started with the lemon juice and Lillet Blanc (ala the Twentieth Century cocktail) but found that they didn't mix well with the Godiva. Eventually, we switched out the lemon for orange and went with a liqueur (Cointreau) instead of using any fruit juice. The Root adds some caramel and sarsaparilla notes to the cocktail that reduce the sweetness and round out the flavour. Adding more than a barspoon causes the Root to overpower the cocktail. The cocktail is not necessarily meant as a dessert drink since it isn't that sweet. But it does have a unique creamsicle taste with a little bit of rusticness from the Root. We tried three different types of bitters, all from Apothecary Bitters. General Ambrose: Brings out more of the Root spiciness. The Darkness: Keeps the Root but decreases the orange. Eldergrowth: Keeps the orange and brings out the sarsaparilla finish. 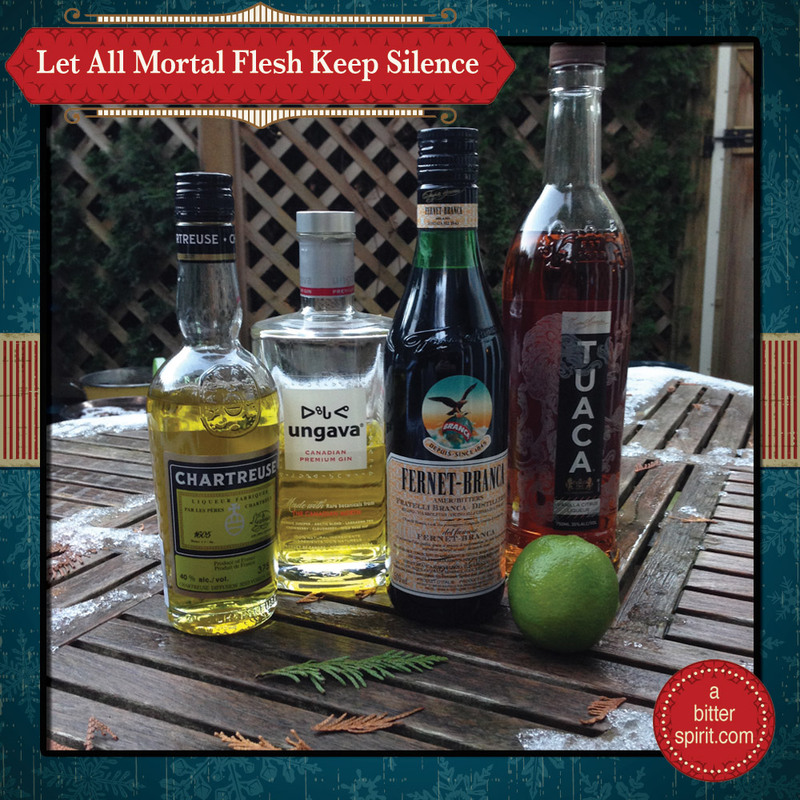 The carol for Day 4 of the Advent Calendar is Let All Mortal Flesh Keep Silence. The text for this carol most likely originated as an ancient Greek chant (like 5th century ancient) but it wasn't until Ralph Vaughan Williams translated a hymn version that it became more frequently used in Protestant services. While the language is archaic, the hymn has grown enough in popularity that it is a common addition to the modern hymnal. 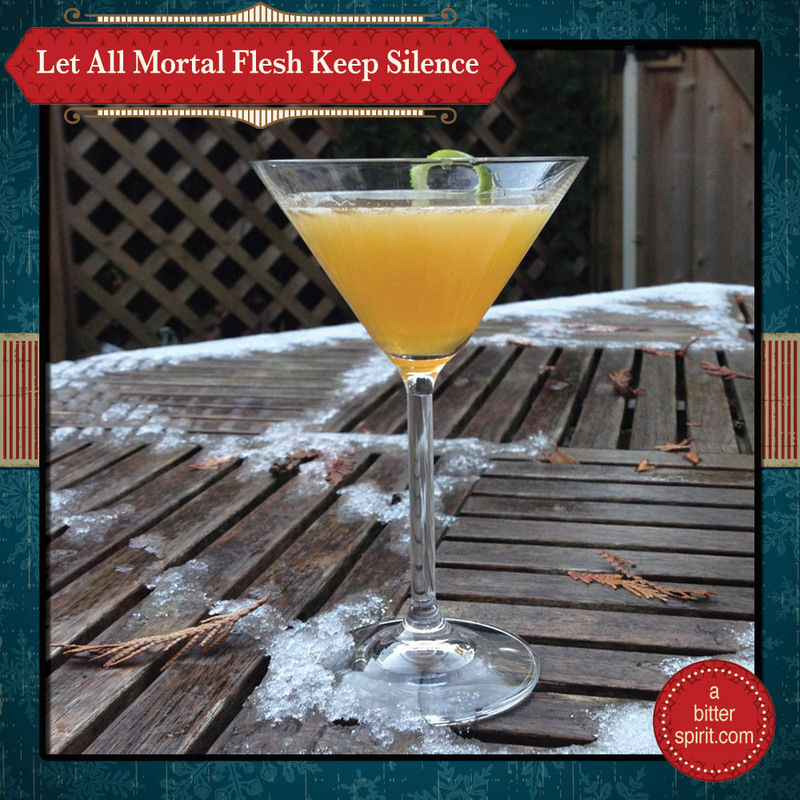 Our first thought for this cocktail was a drink with an equally grisly name, a Corpse Reviver. Corspe Revivers are a group of classic cocktails that were used by turn of the century imbibers to help with their morning hangovers. A bit of the "hair of the dog" if you will. Or something to help revive you when you feel like the dead. The most popular of these drinks is the Corpse Reviver #2 which consists of gin, an orange liqueur, lemon juice, Lillet Blanc & an absinthe rinse. Given this general formula, we played a little with the components, keeping the gin and subsituting in lime juice, yellow chartreuse for absinthe and some fernet branca. The result has a similar taste of the original cocktail but with a more herbeceous and caramel taste. Pour all of the ingredients into a cocktail shaker with ice and shake until chilled. Pour into a cocktail glass and garnish with a piece of lime rind. The Tuaca has a citrus taste but also adds a slight caramel flavour. The chartreuse adds a more herbacous taste than the original has but plays well with the lime juice. The addition of the Fernet Branca helps round out the cocktail. Our second carol is Fum, Fum, Fum, a traditional Christmas song from the Catalan region of Spain. Dating from the 14th or 15th century, it didn't become popular in English speaking countries until the 1950's when Robert Shaw & Alice Parker published it in their collection of Christmas carols. "Fum" means "smoke" in Catalan but several carolbooks suggest that "fum" might be more of an onomatopoeia. Perhaps it is a reference to the sound a strummed guitar makes or a reference to a rocking cradle. 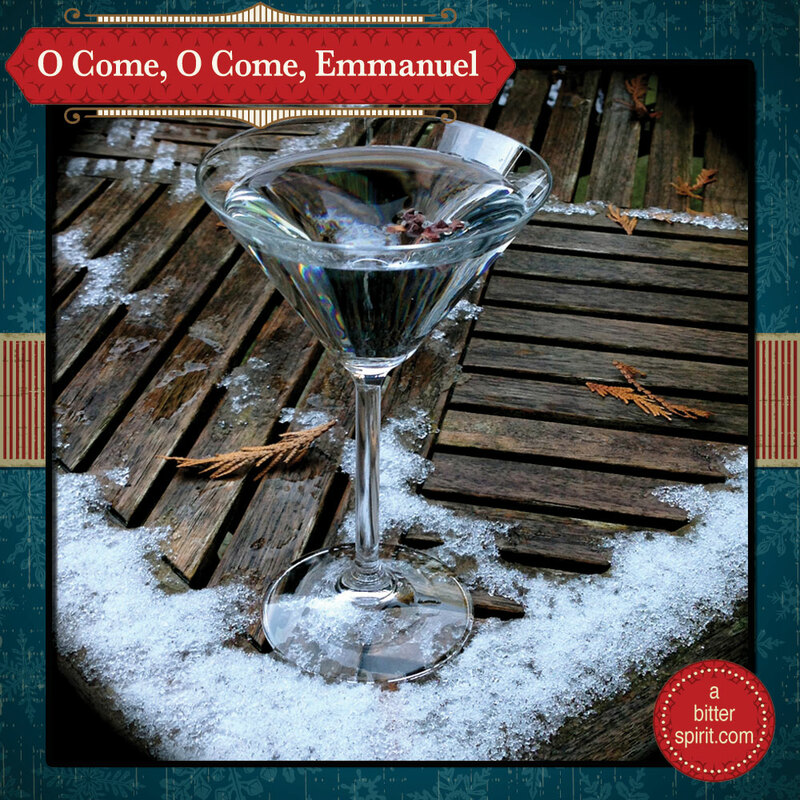 Regardless, it's nearly impossible not to have fun while singing this carol and periodically entoning, "Fum, fum, fum." 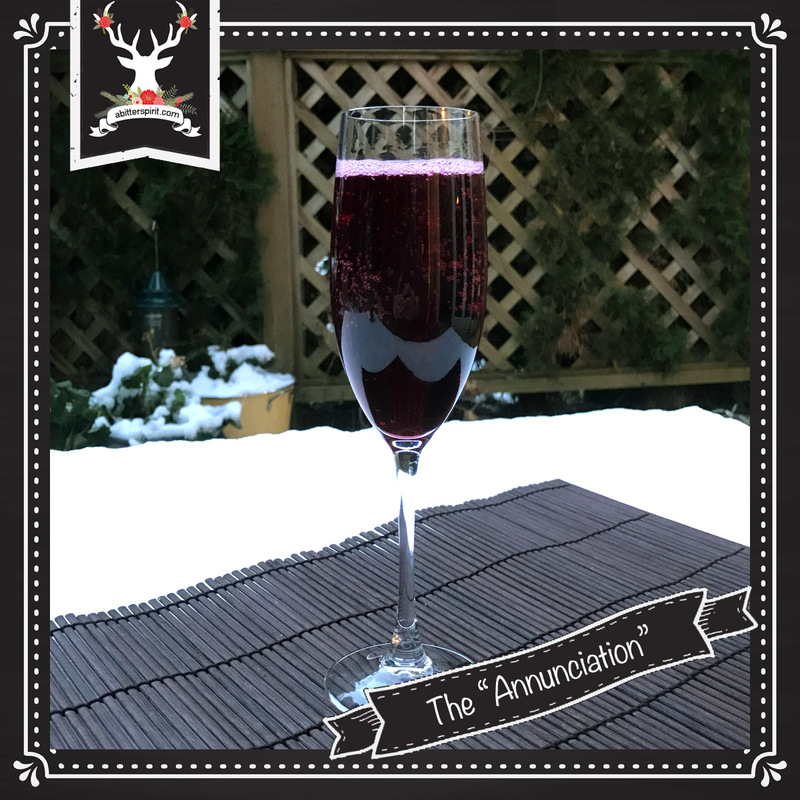 When crafting a cocktail that could embody this carol, we immediately wanted it to be fizzy to reference the "fum." We also wanted gin to be the base spirit since Spain is the second largest global consumer of gin. The combo of gin and fizzy instantly brings to mind one particular cocktail, a French 75. At the time of this cocktail's conception, Drew had Moscow Mules on the brain and wanted to use lime and ginger. 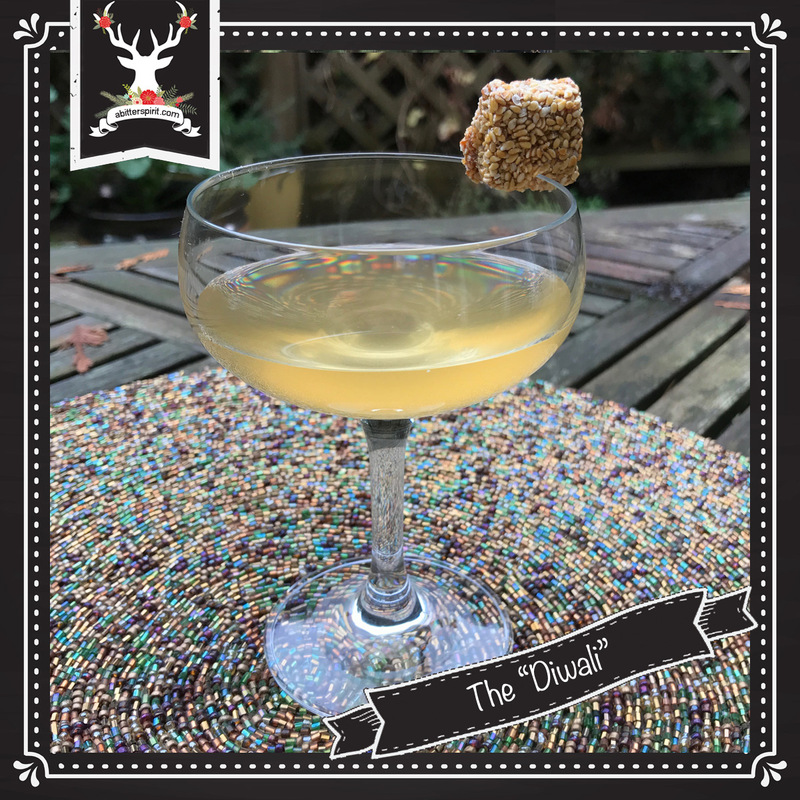 Our Fum, Fum, Fum cocktail is a quirky combination/deconstruction of these two classic drinks. We sustituted cava, a sparkling Spanish wine, for the champagne traditionally used in the French 75. We used lime juice instead of the lemon ala the Mule and made a ginger-infused gin as the base. Fill the glass with ice. Add gin, lime juice and simple syrup to the glass. Top with cava. Add the cocktail spice and stir slightly. We made the ginger infused gin by placing about 5 inches of thinly sliced ginger root into a container with 1 cup of gin. The infusion is good to go after about a day but can sit longer for a bitier taste. Both the gin and cava we used were very dry (Beefeaters & a brut respectively), and we needed the simple syrup to sweeten it up. If you use a sweeter cava, you probably won't need the syrup. We thought that the Thai cocktail spice really rounded out the ginger flavour and added another dimension of spice that you'd find in ginger beer. Scrappy's Firewater bitters or even a barspoon of a pepper vodka might also substitute. We're down to the final three of our calendar, and we wanted to finish with a flourish. So we're invoking the legend of the Three Wise Men of the East, aka The Magi, as the theme for our remaining cocktails. According to the Bible, wise men visited the Baby Jesus after his birth and presented him with three gifts.